Owners of waste electronic equipment have to recycle these separately from the unsorted municipal waste. Waste electrical and electronic equipment must therefore not be disposed of as unsorted municipal waste and in particular does not belong in the household waste. Rather, these old devices should be collected separately and disposed via the local collection and return systems. Owners of waste electronic equipment also have to dispose used batteries and accumulators, which is not enclosed by the old device, prior to submission to a collection point. The latter does not apply insofar as the old appliances are separated from other old appliances in accordance with § 14 (5) sentences 2 and 3 ElektroG as part of the opt-in by the public waste disposal carriers in order to prepare them for reuse. Using the symbol in accordance with Annex 3 to the ElektroG, owners can identify waste electronic appliances that are to be recorded separately from unsorted municipal waste at the end of their service life. 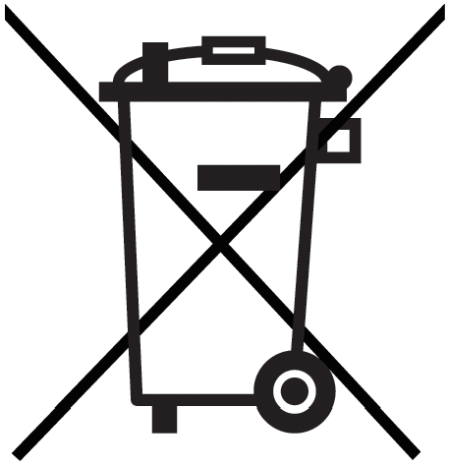 The symbol for the separate collection of electrical and electronic equipment represents a crossed-out wheeled bin and is designed as shown on the left. Owners of waste electronic equipment may hand them in as part of the public system for returning and collecting waste electronic equipment to ensure the proper disposal. Optionally, there is also a delivery of electrical and electronic equipment for the purpose of reuse of the equipment possible. Further information can be obtained from the respective collection or return point. On waste electronic equipment to be disposed there might partly be sensitive personal data (such as on a PC or a smartphone), which must not be put in the hands of third parties. We expressly point out, that the end-user of waste equipment is responsible for the deletion of personal data on the waste to be disposed of. We are registered in the Stiftung Elektro-Altgeräte Register, Benno-Strauss-Str. 1, 90763 Fürth as a manufacturer of electrical and/or electronic equipment under the following registry number: DE80965720.